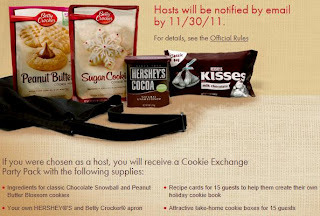 Being Frugal and Making It Work: HERSHEY'S and Betty Crocker Cookie Exchange Party - I'm a Host! Don't forget to visit HERSHEY®'S Cookie Headquarters to find cookie exchange tips for planning your party, recipes to get you started and access to a team of experts to answer all of your baking questions during the busy holiday baking season. You can also share your own favorite cookie recipes and photos from your parties with other cookie enthusiasts! Did you get chosen to host a Hershey's and Betty Crocker Holiday Cookie Exchange Party?